India is in the middle of its festive season that will see its climax with the celebration of the festival of lights, the Diwali in November this year. Currently marking the birth of the Elephant god Ganpati, Indian retailers are conveying alluring offers in order to receive the festive season boost. Among others, the Japanese performance bike maker has brought a cashback offer of up to INR 9000 on selected models. It is a great opportunity for those who are willing to opt for any of the bikes on offer. Likewise, the newly introduced Ninja 400 in sports category along with aggressive naked streetfighter the Z650, and the Z250. 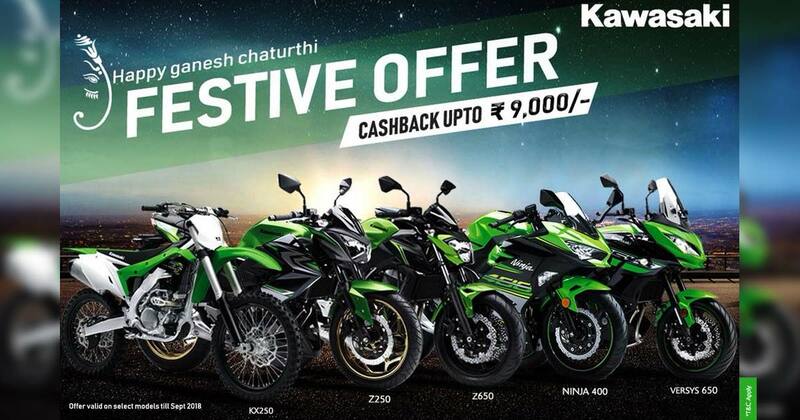 In addition to this, the offerings belong to adventure touring and dirt biking respectively, the Versys 650 and the KX250 will also benefit you with the amount up to INR 9000 in the form of cashback on ex-showroom price. Let me remind you, it’s a limited offer valid till Sept 2018. So this Ganesh Chaturthi bring an all-new Kawasaki at home and feel proud. Hurry up!! To grab the deal before it's too late. For further inquiries, rush to your nearest dealerships and know the hidden terms and conditions.